FOXBOROUGH, Mass. (AP) — The New England Patriots reminded everyone why they are still the pride of the AFC East. With a 3-0 start to the season, the Miami Dolphins emerged as an early threat to the Patriots’ run of nine consecutive division titles. The Dolphins are now left to regroup after a 38-7 loss to New England on Sunday , having been denied their first 4-0 start since Hall of Fame coach Don Shula’s last season in 1995. The Patriots, meanwhile, are back to 2-2 with a short week to get ready for Thursday night’s matchup with the Indianapolis Colts. It was the first time this season that the Patriots have resembled a team capable of making a run at its third consecutive trip to the Super Bowl. Part of the reason is, Belichick’s team clearly isn’t yet at full strength. Defensive end Trey Flowers and safety Patrick Chung returned to action after missing Week 3 with concussions. But Brady is still trying to get the most of a new-look group of receivers following key offseason departures. He made progress, tossing a 55-yard TD pass to Cordarrelle Patterson and a 9-yard TD to rapidly improving Phillip Dorsett. Still, the offense may have taken another hit on Sunday after tight end Rob Gronkowski left the game in the third quarter with a right ankle injury and didn’t return. Gronk had been questionable all week with an ankle issue. The good news for Brady is that receiver Julian Edelman is now eligible to play after being suspended for the first four games of the season for violating the NFL’s policy on performance enhancers. He can officially rejoin the team on Monday. There is also plenty to be excited about on defense, which held Miami to just 172 total yards and 3 of 11 on third down. New England entered the game giving up more than 400 yards of offense per game and allowing opponents to succeed on 49 percent of their third down opportunities. After turning in his worst effort this season, Dolphins quarterback Ryan Tannehill said he will be focused on recapturing how he started the season and not dwelling on his shortcomings in this game. The Patriots improved to 8-0 following consecutive losses since 2002. That is also the last time the Patriots have lost more than two games in a row (lost four straight that year). Just moments before Gronkowski’s injury, he hauled in his fourth catch of the day, the 491st of his career. It marked a franchise record for catches by a tight end, passing Ben Coates. For the day, Gronk had four catches for 44 yards. Long snapper John Denney played in his 212th straight regular-season game on Sunday and is the NFL’s leader among active players for consecutive games played. He has appeared in every Dolphins game since signing with Miami as an undrafted free agent in 2005. 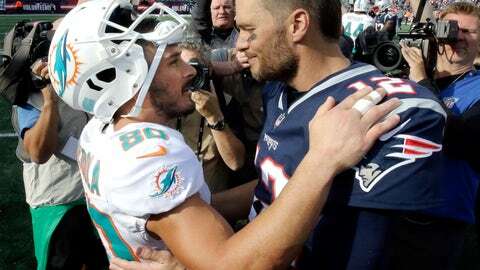 Dolphins receiver Danny Amendola was a fan favorite during his five seasons in New England. He returned for the first time since he signed with Miami this past offseason during free agency. Amendola is being used in a role like the one with the Patriots — returning punts, in addition to his receiver duties. He finished with two catches for 21 yards against his former team. “They are a good team and we didn’t play well enough to beat them,” Amendola said.